Stop calling it SEO. 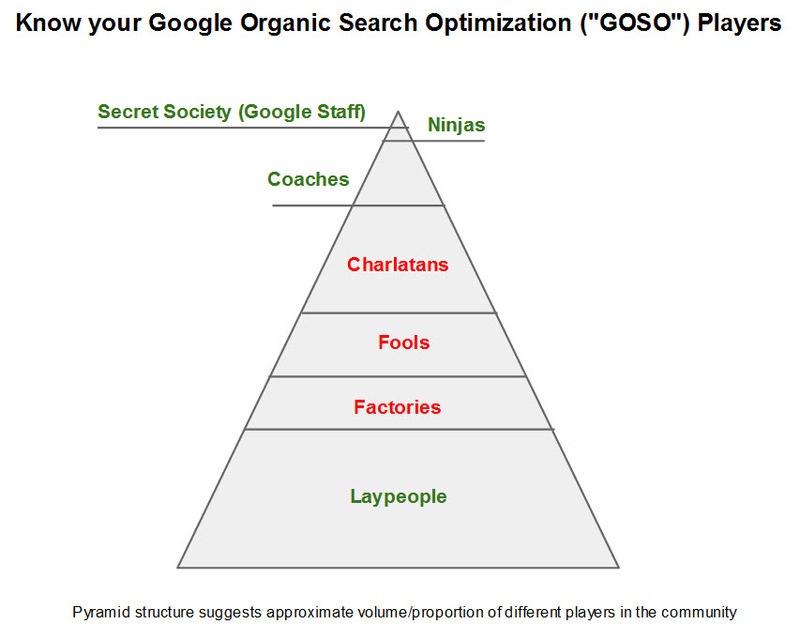 What we really mean to say when we say SEO is “Google Organic Search Optimization”–so i’m going to start calling it that, GOSO. I studied history in college and remember (perhaps incorrectly?) 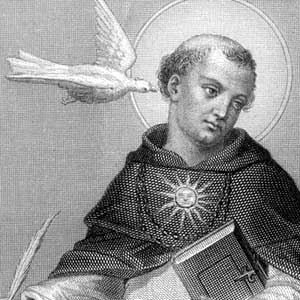 that the 13th century philosopher St. Thomas Aquinas characterized people as having various tiers of spiritual and intellectual access to god: some experiencing the church teachings as literal narrative, others as parable, and at the purest/highest echelon, altogether different divine connection. GOSO similarly has different levels of access and understanding, divided into 2 major groups. Secret Society GOSOites (insiders). These are the several 1000 Google employees that work on the actual algorithms and on any given day, as a collective consciousness, could tell us all *exactly* how the system works and how to create content and what tactics to take on the web to *guarantee* success. (note that any single member of this tribe actually does not have full consciousness… it really requires a hive mind to grok at this point!) Members of this group have never, and will never, speak about specifics on the subject of GOSO’s true inner workings. Spokespeople for Google such as the excellent Matt Cutts (his blog here) talk about GOSO and give guidelines, but these become the least-common-denominator best practices that everyone (who is competent) follows, thereby creating a series of hoops that we all must jump through just to get back to the starting line, and thus largely removing any real positive impact from following them. I call this the GOSO Tax–it is web development, copy writing, and significant time and energy that must be invested just for table-stakes… to actually get ahead, you need to go further, and will have to look elsewhere. Unfortunately every business owner I know has to deal with this hidden but significant tax, or suffer the consequences of *really* tanking and getting NO organic traffic. GOSO Ninjas. Just like a real Ninja, you’ve never heard of, seen, or talked to a GOSO Ninja. By their very definition, these people are unknowable. Here’s why. These are the folks that have reverse engineered or otherwise figured out (albeit sometimes just for a window of time, before google employees track down and close the loophole) how to *print money* with GOSO. Just like a alchemist that has discovered how to synthesize solid gold by mixing water and sand, a GOSO Ninja has access to the arbitrage that comes with knowing how to really manipulate SEO rankings and by extension, to drive meaningful volumes of clicks/traffic which is a commodity that can be turned into ready cash. GOSO Ninjas work for *themselves*… printing money for *themselves*… and they keep all knowledge about GOSO strictly for *themselves*. If you discovered a limitless well of solid gold, would you charge $150 USD an hour to teach other people how to extract gold from the well, knowing that in doing so it would only take a few extra folks tapping into your well before the well would be sealed off by Google? Or would you be greedy, and just pull gold from the well for as long as you could… maybe take several trips a year to exotic luxury islands and enjoy your Ninja-ness? Oh, and anyone that claims to be a GOSO Ninja is a fool, because they don’t even know what they don’t know, which is that they are NOT. 1st rule of GOSO ninjadom, you don’t talk about GOSO ninjadom!! “I can’t tell you what i do, when i do it, or how i do it–because xxxx”–where xxxx is any excuse of any kind–there is NO legitimate reason why a vendor doing hourly labor work as a service would not be able to fully document their activities. They report on their success/progress with statements like “we are making great progress, we have moved from position X to position Y in google results”–(one possible exception is where Y is the number 1, 2, or 3.) Even if you are getting ranked in the top 3 positions, reporting the “ranking on the page” as the primary measure of success is disingenuous, because SOOO many factors are involved and the direct activities of your vendor are probably only one small part of that success. It is more likely that the New York Times wrote an article about you or your customers are raving about you on Facebook or Twitter, and that is what drove your breakthrough–and any social media driven SEO vendor would be characterizing your success because of their work for you in social metrics, not in page rank slots! “Page rank slot up/down movement” is the stuff of charlatans and fools. GOSO Fools. These are vendors that don’t know what they don’t know but have no sinister intent. They often will refer to online experts as sources to credit their activities and tactics, but unlike coaches who go straight to the source (Google is the only source! ), they will quote 2nd and 3rd degree references much like when we were in high school and used Encyclopedias for a quick fix of “expertise”. The heresy of “such and such SEO expert” (usually a GOSO Charlatan or other Fool) is foolish testament, unless they are preaching the one true faith–the inherent *futility* of GOSO expertise to begin with! Again, if it was knowable and scalable, Google has already closed the gap–so fools are simply trading in the lowest-common-denominator of best practices, but representing this information as something special and valuable, when it is not. GOSO Laypeople. This is the majority of the online community, of both creative and technical web professionals as well of the business owners and marketing professionals that they serve. They are either angst ridden about the subject of SEO, and in search of a Coach… or they are at peace, comfortable in their bliss of unknowingness and spending their karma points on other things (SEM perhaps!). Nobody reading this post (which should have been interpreted as intentionally faux-serious-silly) should feel offended by my segmentation except for the Ninjas (who don’t like their existence to even be mentioned).